For current statewide information on statewide snow conditions, log onto the Wisconsin Department of Tourism's Snow Conditions Report (exit DNR). The snow drought has continued yet another week with only flurries and some far north lake affect snow reported. That could change if a snowstorm forecast for Friday into Saturday arrives and finally brings some snow to southern Wisconsin. That storm will be followed by cold temperatures just in time for the lunar eclipse on Sunday night. Snowmobile and ski trails remain open mostly in just the northern tier of counties but conditions are still being reported good in some areas despite the lack of new snow on the Wisconsin Department of Tourism's Snow Conditions Report (exit DNR). A few state properties have been able to groom ski trails on the Cross-country ski trail conditions page of the DNR website. Ice reports continue to be highly variable with many lakes in southern and central Wisconsin still having areas of open water. A reminder that no ice is safe ice and that couldn't be more true this year with the warm ups. The colder weather should help firm up ice conditions. Ice fishing activity has picked up but many anglers report lethargic and finicky fish. Those anglers have been having success report nice catches for panfish and northern pike. The Fox River at Voyageurs Park is mostly open and anglers fishing the lock canal earlier in the week report catching perch and small walleye open water fishing. Increasing numbers of ice shanties are showing up on some of the smaller bays of Green Bay mostly fishing whitefish and perch. Access has been difficult at many locations because of ice shoves. Anglers fishing off the east and west shores of Green Bay report catching some whitefish and perch but mostly of smaller size. This coming weekend, Jan 19-20 is Free Fishing Weekend. Anyone can fish without a license but all other regulations apply. Both Kettle Moraine north and south are offering fishing clinics on Saturday. MacKenzie is also holding one that requires preregistration. Clinic at Devil's Lake and Richard Bong have been cancelled due to poor ice conditions. For additional clinics across the state search the DNR website for "free fishing." The lack of snow has also lead to additional candlelight events cancellations this weekend. Events at Governor Dodge, Lake Wissota and Rib Mountain have been cancelled. Despite the lack of snow, candlelight events will go on Saturday night at the southern Kettles, Horicon Marsh and for a special fee at Heritage Hill. The Horicon Candlelight event is extremely popular and there have already been thousands of people who expressed interest in attending on social media. The Education Center will be limiting parking to families with young children and vehicles with disable parking permits. All others interested in attending are urged to take shuttles. Check the DNR website or Friends of Horicon website at www.horiconmarsh.org for details. This weekend is also the extremely popular Eagle Watching Days at Sauk City and Prairie du Sac, with the release of three rehabilitated eagles to the wild on Saturday and opportunities to see eagles perching or soaring above the Wisconsin River, and view eagles up close indoors during live raptor shows. 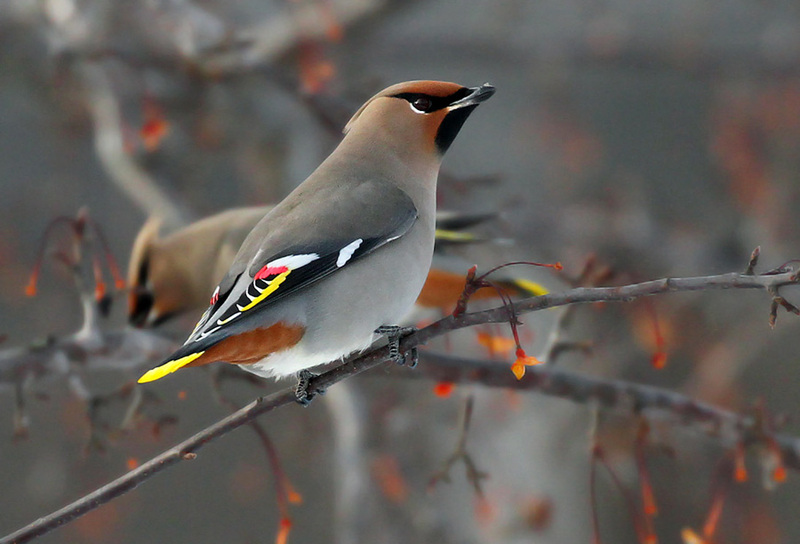 New flocks of Bohemian waxwings have appeared across the north, suggesting fruit sources even farther north are waning. Other winter favorites being seen right now include various raptors such as bald eagles, red-tailed hawks, Cooper's and sharp-shinned hawks, American kestrels, and great horned owls. The mid-winter birding scene remains relatively unchanged from recent weeks. However, a pending cold spell combined with new snow in southern Wisconsin should increase feeder activity at least somewhat. Clear snow from feeders, provide sheltered areas out of wind for feeding, and offer sunflower seeds, suet, and other favorites and you should be rewarded with some happy feathered friends. Keep an eye out for Carolina wrens, a southern species that fares well during mild winters. Sightings have been reported of late as far north as Portage and Brown counties. 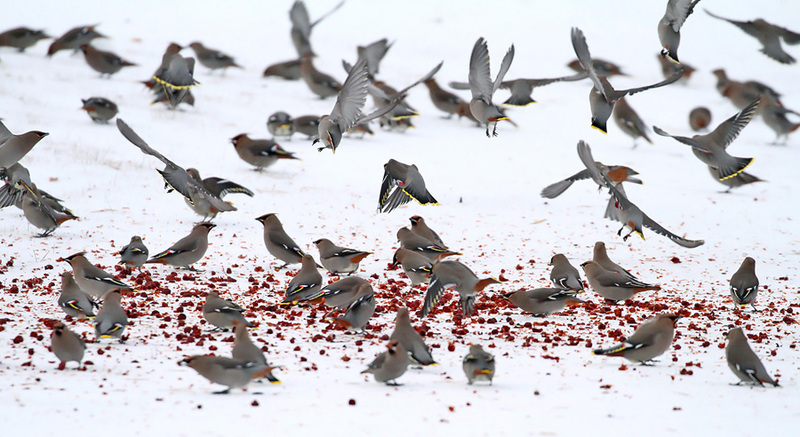 New flocks of Bohemian waxwings have appeared across the north, suggesting fruit sources even farther north are waning. Towns with known flocks this week included Tomahawk, Minocqua, Eagle River, Rhinelander, Ashland, Cornucopia, and Sister Bay. Pine grosbeaks are often found in the same areas. Waterbird watching has been decent along Lake Michigan, the mild weather yielding open water and variety of waterfowl at various lakeshore points. Gull diversity is also good this time of year there, including great black-backed, Iceland, and glaucous amid the many herring gulls. Want to learn how to identify different gull species? Join an expert-led field trip in the Fox Valley on Jan. 26 - learn more https://bit.ly/2CuvkQP . Jan. 19-20 is free winter fishing weekend in Wisconsin and both Kettle Moraine north and south are offering fishing clinics on Saturday. MacKenzie is also holding one that requires preregistration. Clinic at Devil's Lake and Richard Bong have been cancelled due to poor ice conditions. Anyone can fish without a license this weekend but all other regulations apply. Despite the lack of snow, candlelight events will go on Saturday night at the southern Kettles, Horicon Marsh and for a special fee at Heritage Hill. Note that shuttles are recommend for Horicon, which has been extremely popular in the past and has very limited parking. Candlelight events have been cancelled for Saturday at Governor Dodge, Lake Wissota and Rib Mountain due to icy conditions. On Sunday night visitors to Harrington Beach can view the lunar eclipse from the observatory near Puckett's Pond if skies are clear. Click on the links below for highlighted programs this weekend or click on Get Outdoors," for a complete listing of events. Jan 19, 9 a.m.-noon: Rocky Run - Get exercise and enjoy the brush pile fire at Rocky Run SNA! Help cut and burn brush and cedar trees and learn something in the process. Rocky Run has sand prairie and oak savanna that has been taken over by invasive shrubs and cedar trees which reduce the native understory diversity. Remove these trees to encourage rare animals and plants on the site. There will be an optional potluck lunch afterwards! Jan 19, 10 a.m.-1 p.m. Chiwaukee Praire Workday: Cutting and burning brush - Help Chiwaukee Prairie Preservation Fund volunteers during our monthly workdays on the third Saturday and enjoy the beauty of this rich prairie in the process. We will be removing invasive brush that can dominate the prairie and displace native plants. Jan 24, 9 a.m.-noon: Bluff Creek Workday: Cutting and burning brush - Get outside and cut up buckthorn at Bluff Creek SNA. Come enjoy spring weather and help volunteers during our monthly Southern Kettle Moraine SNA workdays on the second Saturday. Enjoy a short hike, then help cut and pile brush, learn something, meet knowledgeable people, and enjoy the beauty of this fen area in the process. We will remove buckthorn that can spread and shade out rare fen and savanna plants at this site. Copper Falls State Park - Cross-country ski trails were groomed for skate and classic cross-country skiing and were tracked on Monday, Jan. 14 and are in fair condition. Groomer is currently down so trails will probably not be groomed again before the weekend. Kettle Moraine State Forest - Lapham Peak Unit - Cross-country ski trails at Lapham Peak were groomed Tuesday night and are in good shape. The new sections of trail were tilled today and will be opened to skiing Wednesday, after the snow has a chance to firm up. The new sections will be two way traffic until the final segment is complete. The final segment should be completed sometime next week. Lights will be on every night until 9 p.m. except Sunday. No lights on Sunday. Good air quality for Wisconsin on Wednesday, April 24, 2019 at 3:21 pm CT.